We can service and M.O.T your car in the same day. 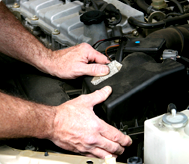 If any repairs are necessary we can usually undertake these whilst you are here, saving you both time and money. Remember our servicing and repairs will not invalidate your manufacturer's warranty. A BMW service with Servicing Stop network covers all the models within the BMW vehicle range; we can give you an X5 service, M3 service or BMW 1 series service to the standard you would expect. German prestige cars, like the BMW, must be maintained at the highest level, making sure approved parts and oils are used to ensure your BMW is running at its optimum level and warranty is protected every time. If you do not see the BMW model that you have within the above list, please call us and we will give you a great quote for your BMW service. There's never a good time for your BMW & Mini car to be off the road. Inevitably, your daily plans are interrupted as you endeavor to source BMW & Mini car parts. Luckily, we have a large selection of genuine BMW & Mini parts instantly available to be rapidly shipped to you at an affordable price.